Since getting my hands on this book 50 + 1 Malaysia by QuaChee and his team, I had been reading it from the very first page. Now I have come to the last page. And what do I think of it? There is one very obvious feeling from reading the book. I feel a great love for my country Malaysia. I have always loved Malaysia and with this book, my love grows even more! I would have to say to my fellow Malaysians – the grass is not always greener on the other side. Despite the political situation in this country, I still say Malaysia is the place to be. Malaysia is my home, and the best place to be on planet Earth. How else can you explain countless foreign expatriates setting up their second homes in Malaysia? Anyway, back to the book. I thoroughly enjoyed myself reading it! I like the fact that terms and words that are eccentric to Malaysians are properly explained. Words like lah, syiok, alamak and so on. Foreigners reading this book will have a better understanding on how we talk. At least they would better appreciate Manglish, also known as Malaysian English. The first chapter on things that are truly Malaysian is a wonderful read and very comprehensive. It covers everything uniquely Malaysian from the orangutan to lion dance, from gasing to Ah Long and 4D or empat ekor. It even mentioned what is known as Malaysian Time and what is this very popular open house concept and balik kampong, which are things you can only observe in Malaysia and nowhere else. The second chapter on food is definitely my favourite subject. Malaysian food is so tasty and unique a foreigner once told me that after having eaten Malaysian food, he found his own country's food bland and boring in comparison! And this book has very good description of my favourite foods (with very good pictures too!) like onde onde, pineapple tarts, satay, nasi lemak, roti canai and even Ramly burgers and of course the famous durian! What really makes this book different from others of the same genre is the comments given by individuals. For example, one of the comments on eating the onde onde – how biting it and letting the gula melaka juice bursts in the mouth makes me salivate to no end. Wonderful! The third chapter on places to visit is a must-read for foreigners and locals alike. Honestly, I haven’t been to every one of those places and I claim to know Malaysia – how embarrassing! The book definitely provide a good guide to famous places like Jonker Street in Melaka, Kek Lok Si Temple in Penang, Sipadan Islands in Sabah, Taman Negara in Pahang, Tasik Kenyir in Terengganu, and the Mulu Caves in Sarawak. These are must-visit places in Malaysia. Besides knowing what places to visit, you must also know what are things you can and must do in Malaysia. This book gives a good guide on all that in the fourth chapter but what surprises me is it even mention things like driving along the North-South Highway, shopping at hypermarkets and having a Malaysian wedding among the list of things to do! How comprehensive is that! The fifth chapter is interesting, especially to a foreigner who have never been to Malaysia. 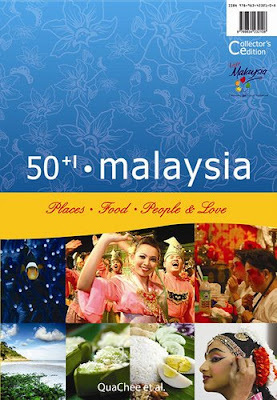 It talks about cultural events and festivals in Malaysia. I’m quite surprised Bon Odori and even Loy Krathong were mentioned as these are not really Malaysian festivals, but nevertheless celebrated here as well. I love the sixth chapter which focus on Malaysian celebrities and famous people. What I like is the “up close and personal” interview with these stars like Anuar Zain, Amber Chia, Hannah Tan, Jaclyn Victor, Fish Leong, Michael Wong, Maya Karin, Mawi, Nicol David, Siti Nurhaliza, and our own Angkasawan (astronaut) Dr Sheikh Muszaphar Shukor among others. If you want to know what these celebrities love about Malaysia, go get this book! Finally, the last chapter is a chapter on love. Yes, what Malaysians and even non-Malaysians love about Malaysia. It is a loving dedication to our beloved country and may even make you cry. Overall, this is a great book to have. I have only one complaint – the book is too small! If only it’s bigger, the words would be easier to read! However, that’s a small matter compared to so many benefits you can get, therefore I highly recommend this book. Priced at RM51, it’s worth your money. But here’s good news. For a limited period of time you can order it online at The Malaysia Page for only RM35!! Before I end my post, I would like to thank QuaChee for the message he personally left on the last page of my book. Yes, I truly enjoyed the book and it has inspired me- thank you! I’ll be looking forward to your next book! Sounds as if you really love the book! If I ever have an opportunity to visit your country, I'll make sure I've read this book first. Also, thanks for visiting my site. I have to agree with you that in life..the grass isn't always greener on the other side. Sometimes, if you look at the little good things we have..it all adds up to be a great thing. Of course, I am not saying ppl cannot move elsewhere...move by all means if you have good and valid reasons to. You can take a person out of a country but you can never take the country out of that person rings true? jacqueline, thanks for your compliments. I do hope you will get to visit my country! mbl, totally agree with you! Happy Merdeka To All Malaysians! Beware Of The Hungry Ghosts!